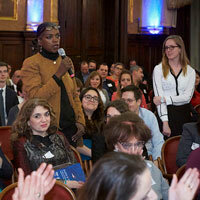 Panelists and audience members discussed the challenges facing the EU. 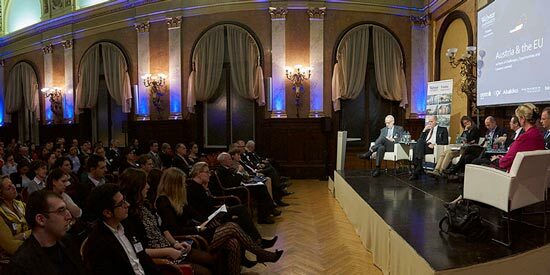 More than 200 guests attended the 8th annual Webster Vienna Alumni Symposium for a panel discussion full of distinguished speakers discussing "Austria & the EU: 20 Years of Challenges, Opportunities and Lessons Learned." Following a warm welcome by Webster Vienna’s new director and social scientist, Bernd Marin, outstanding Austrian personalities such as Erhard Busek, Stephan Koren, Bettina Lorentschitsch, Johannes Pollak, Heimo Scheuch und Barbara Weitgruber exchanged ideas concerning the future of the European Union (EU). All debaters agreed that one of the main problems of the European Union is the lack of a pan-European identity, as the focus still rather lies on national identities. Der Standard managing editor and Webster adjunct faculty member Eric Frey led through the discussion, in which achievements as well as chances of the last 20 years were analyzed. Webster faculty member and political scientist Johannes Pollak is worried about the current situation of the EU and looked at it with a critical eye. About 200 at the annual alumni symposium heard a discussion of the status of the EU 20 years in from leading thinkers from academia, government and the private sector. Scheuch noted that it is economically essential to give Europe a more modern infrastructure in the future. "Bureaucracy needs to be reduced and European values need to be established in politics as well as in economy to foster entrepreneurship throughout all levels of society and all regions," he said. The audience-engaging discussion was followed by a gathering and networking event with representatives from renowned companies such as Erste Group, Novomatic, UBS, Novartis, IAEA, G4S, Economic Senate , Deloitte, Lukoil, Casinos Austria, Raiffeisen, UniCredit, OMV, UNO, Oracle, OSCE, UNIDO and many more.